The is a case made for 12 or 13 inch iBooks or MacBooks of any generation from the original, colorful iBook to the 2012 MacBook Air. There is a uniqueness to this case. 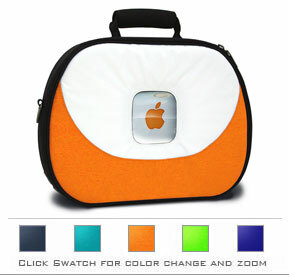 The MacCase Classic is shaped like an old original colorful iBook and has the same design as the original iBook does. It really does feel like an irony putting a MacBook into the bag, but it fits fine. There is a bit of history to the case itself as well. The MacCase Classic was introduced shortly after the original iBooks came out. They were, in a sense, one of the first companies to make accessories for the (more) current Apple products. Admittedly, I do not have one of the original iBooks, however I do have an iBook G4, a MacBook and a MacBook Air to test it with and they all fit fine. 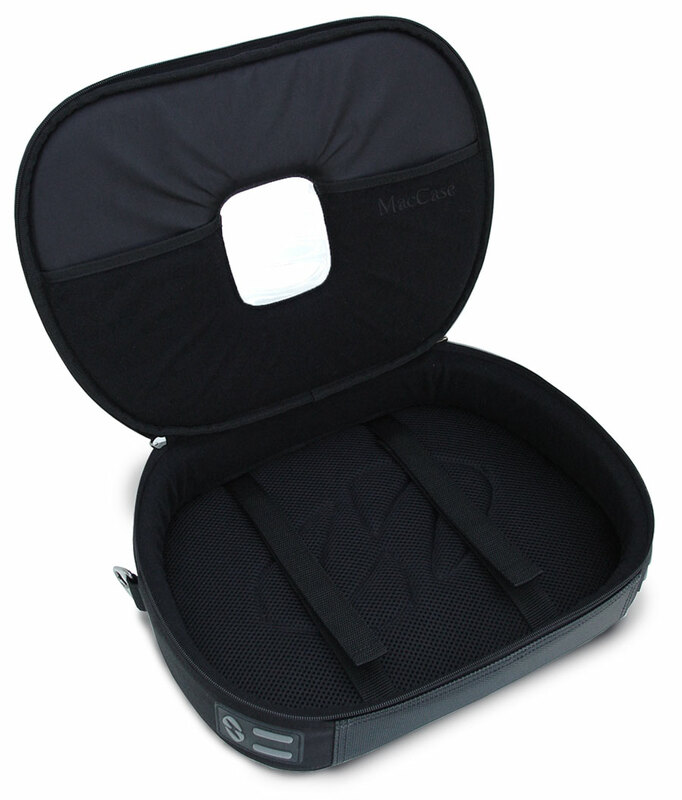 The MacCase Classic is available from MacCase for $29.95. The case definitely does well in this category. The case on the outside has a rainproof material that I can guarantee won’t allow rain in. The case has the cool, original iBook look to it. It has the same oval-like shape with the gumdrop tangerine, blueberry, key lime, indigo and graphite colors, the original colors of the original iBooks. Also, on the top half of the case is the white that the original iBooks had. On the back side is an all black material that feels pretty solid with the addition of a pocket on the back. The pocket on the back will hold your charger so that you won’t stay uncharged. The strap also feels solid and I know that it won’t break. The strap has a part that goes on your shoulder that feels padded and comfortable on your shoulder. The handle on the MacCase is a joy to hold. It feels very comfortable on the hand. Overall, it seems very nice on the outside of the bag. The inside of the bag is the same story. 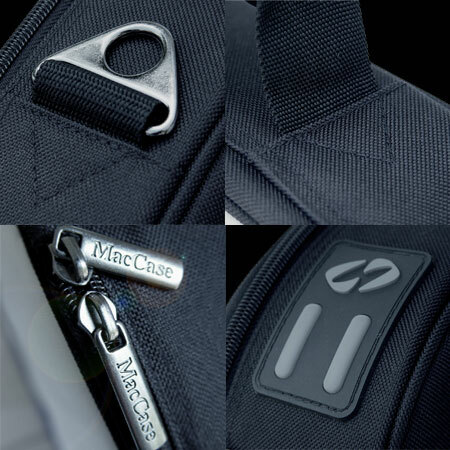 As you open the zipper, which by the way has the MacCase logo on it in the style that Apple put the name “iBook” on the screen, you will see a nice, padded inside. The back where the back of the computer goes is padded, the sides are padded and the front is padded. The only spot that isn’t padded is the clear part on the front where you can see the Apple logo of the iBook or MacBook through, which I think is a nice added feature. There is a small U-shaped pocket on the inside that perhaps you could fit an Apple Remote and some headphones, it really is a nice touch. Again, the MacCase logo with the classic iBook style writing is on the inside. Overall, aesthetically, it is a great case. It is the same story here as in the aesthetics. The case, as I mentioned, is very well padded and the computer will not break in it. The computer will not only be well-padded but it also will be strapped in. This I view as an advantage for a few reasons. One, the computer won’t move inside the bag, limiting any damage that could occur by dropping the bag. Two, the computer will not sag to the bottom to where you can’t see the Apple logo through the clear part on the case. In addition, there is a pocket on the outside of the bag where you can store the computer’s charger. You can’t store much else in the case but then again, you don’t need to. It does protect your computer and it’s power cord for a cheap price. It also provides a conversational piece as well. In addition, to the protection it provides, the addition of both a handle and strap is nice. If you prefer the handle like I do, all you have to do is take the strap off. I know most bags have this ability but it is nice that it has the ability. Like I mentioned before, the case does seem to be waterproof on the front. On the inside, there is a pocket that you could store an Apple remote in, wallet, headphones etc, just some small things that you may need to put in the bag. Lastly, the zippers on the bag seem to zip and unzip smoothly. Ultimately, this bag is as good in it’s function than in it’s form. This suggestion is nothing wrong with the case, it is just something they may want to try. On the original iBook, there was a colored handle that matched the color of the computer. I suggest that they try this, try duplicating the color of the handle with the color of the case for that added original iBook effect. 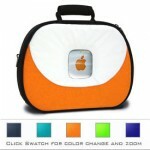 This 12″/13″ iBook/MacBook bag is a great bag. 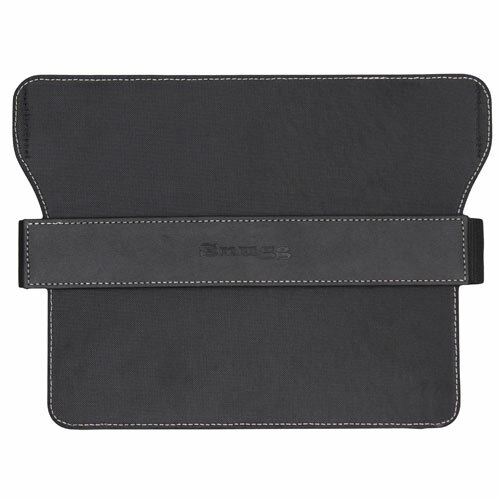 The protection it offers coupled with the novelty and cool factor it offers and it’s cheap price make it an ideal iBook/MacBook bag and easily earn it five stars. Great job MacCase! 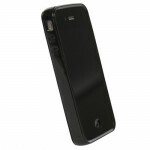 The Gumdrop Drop Tech Series iPhone 4/4S case is a case available for your iPhone 4/4S. 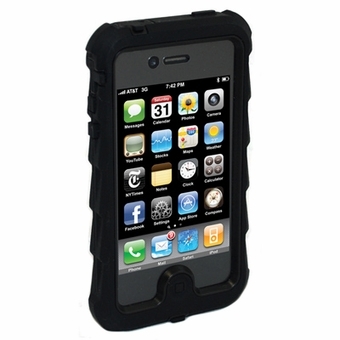 It is a very rugged case durable enough to handle many falls. It is available from Gumdrop for $44.95. Let’s see if it is the case for you. The case definitely is one of the stronger cases I have seen in terms of material. One of the cases I received was black and the other one was light blue and pink. As I received a guy’s case with one solid color and a women’s case, I can’t evaluate the different colors available. However, from the pictures, I see yellow and blue, orange and blue, white and black, black and red, pink and white, green and black and purple and pink cases, they seem to be good colors. The first color is the primary color, the color the rubber part of the case is and the second color of the combination is the outline inside the case. 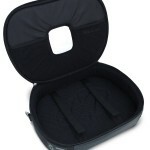 The case is made of a soft but firm rubber material and is easy to hold in the hand. The case is a bit bulky and adds some weight to the phone but then again, what really protective case doesn’t. The case does end up being white after I take it out of my pocket though as the residue from my pocket, and the pocket itself, come out with the phone. This is a concern for me not only aesthetically but also in how it’s function is too. The case does have port protectors, however despite other cases I reviewed in the past, this case has the port protectors attached to the case, which is a plus for me. The case also has a screen protector. The case is durable, protective and, if you buy a colorful case, colorful but it does raise a few red flags for me such as your whole pocket in your jeans coming out with it and the hundreds of white specks that come out with it also. I felt that if I were to drop this case from my second story, my iPhone would still be in the same great shape it was before the fall. That said, the case is extremely durable. 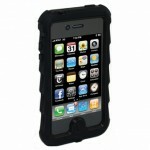 It definitely beats the Otterbox case despite that case being THE case that everyone says is the most protective. I think this one is more so. The screen protector is a plus for me as well as the port protectors. A note about the screen protector; you don’t have to put it on yourself, it’s built into the case. This is great since you don’t have to deal with those annoying bubbles. The camera is not blocked and the case will not cause issues with the camera. The speakers are also not hindered when using this case. All the ports but the silent switch, despite being protected, are easy to access. The silent switch on the side is a bit more difficult to access. There are a few concerns I have with this case though. It is a hindrance taking the phone with this case on out of your pocket. This I think really only applies for men and teenagers of either gender as women tend to put their phones in their purse and not their pocket. Those that put your phone in your pocket you will have some trouble. First off, the black case and a pocket don’t mix. After you pull out the case, white particles cling to your case like glue and it looks tacky. This applies to all cases but especially the black one. In addition, the rubber part of the case will require you to reset it every time you take it out of your pocket. As the case sticks to your pocket, the rubber part will unhinge off of the inner durable plastic part of the case and you will need to reset it. If you have used an Otterbox iPod touch case, you will know what I am talking about. Resetting it is not difficult at all but it definitely is a hindrance on using your phone with the case. Also, you texting teenagers out there listen up, the case does not allow easy access to the letters on the left and right extremes of the keyboard when you put it in portrait, such as q and p. However, these letters are more accessible when you turn it over to landscape mode, which is the preferred texting orientation. However, those that like to text in portrait or those that use their keyboard in portrait, you will have a tough time typing the q and the p. Despite these flaws however, the case still protects very well and I think that they did a good job with the case. I believe that there are a few ways to improve going forward. First, use a material that will not stick to your pocket. A non-stick cover is something that is needed here without losing any of the ability to protect. Second, lower the depth so people can type on the keyboard without their finger hitting the side of the case. Third, allow easy access to the silent/vibrate switch. Perhaps add a rubberized switch that goes over it and extends down to the actual switch, see a LifeProof iPhone case for more detail. Additionally, find a way to cut down on the thickness. Skinny jeans and this case don’t go well. The case is definitely one of the more protective case I have used. However, so was my iPod touch Otterbox case and I took that one off of my iPod touch because of some of the same reasons as the cons listed here. 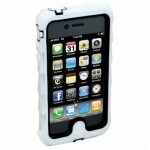 However, this case offers even more protection and durability than that case did. The case does have some (major) kinks to get out, however those that don’t care about the hindrances I described this is a great case. 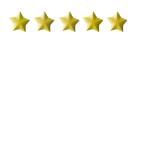 As I do care about these hindrances, I can evaluate this case at a 3 and a half star rating. The case knocks it out of the ball park in terms of protection but strikes out in some key areas. 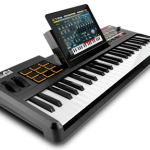 The Akai SynthStation49 is a 49-key keyboard that is made to go with an iPad. You can use the effects on apps on your iPad which then turns into sound after pressing keys on the keyboard. 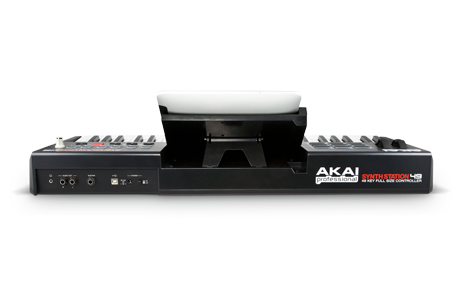 The apps you can use are not limited to Akai’s SynthStation app. You can use the keyboard with any app that has sounds for a keyboard, for instance GarageBand is an app that has it, which is a great app for this keyboard. The keyboard is available direct from Amazon for $219.99. 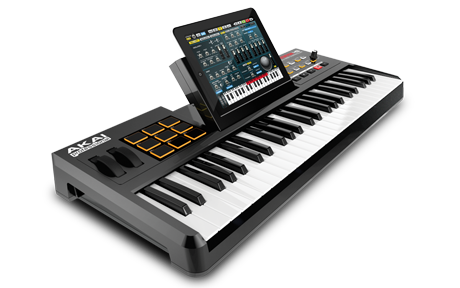 That number seems like a high number but those who need a keyboard on the go with their iPad for recording should use the Akai SynthStation 49 as it is the most versatile keyboard for the iPad I have seen. As the form isn’t nearly as important as the function, I will be brief but I do want to mention a few things. First, the keyboard is very durable and I trust that it would not break if dropped. The layout of the buttons is clean and not confusing. The iPad fits right on it and it is easy to plug in. The buttons were made of a soft rubber that feels nice to the touch. The keys of the keyboard more importantly feel comfortable and play comfortably. Aesthetically, this keyboard is great! The keyboard itself definitely works like a champ. The keys are solid and are pleasant to play on and if you use the right app sounds great! I would avoid using the Akai SynthStation app that is free on the App Store. You get what you pay for and the free app is not good. The sounds are terrible and there isn’t even a standard piano sound which I found surprising. However, that does not deter away from the productivity of the keyboard since any music production app such as GarageBand works great on the keyboard. It isn’t a full 88-key keyboard, but it doesn’t have to be, it allows you to go up and down octaves easily, effectively and fast. 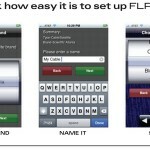 Using the right app, the keyboard works great. The buttons need to work with all apps, that is something that doesn’t happen. All the buttons only work on the Akai app which you don’t want to use. However, must buttons are still usable when using third-party apps. Another thing, other production keyboard require the Camera Connection Kit but I appreciate that this one does not, it plugs right into the 30-pin. You can also plug in your computer to it via MIDI/USB which is a huge advantage considering that I use the app Synthesia when learning a new song (check it out, it’s a great app!). Also, I can use my pedal with it which is a plus. When it is plugged into the wall, it also charges the iPad. Overall, the keyboard does what it needs to do and excels at doing it. One way to improve is to rebuild the app. The sounds on it don’t sound right, there isn’t even a piano sound on there. GarageBand did a much better job with the keyboard than the app that specifically goes to the keyboard did. I would recommend picking up some sounds and design tips from GarageBand while adding more features than what GarageBand has. 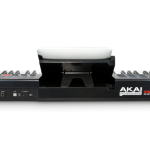 Another way is just to ask developers, such as Apple or whoever makes apps that go with a keyboard like this, to allow them to add coding that would take full advantage of the buttons on the Akai SynthStation49. Don’t get me wrong. This keyboard is a solid keyboard that anyone could feel comfortable doing a show with. I have played the piano for a long time and I can tell you that the action and the feel of the keys is better than a lot of other keyboards. The plethora of sounds you can get from the plethora of apps available make up for the SynthStation iPad app. This keyboard isn’t the greatest keyboard on the market but if you have an iPad, you can take advantage of the plethora of apps and for the money. It is the best deal for the money you can find in my opinion. 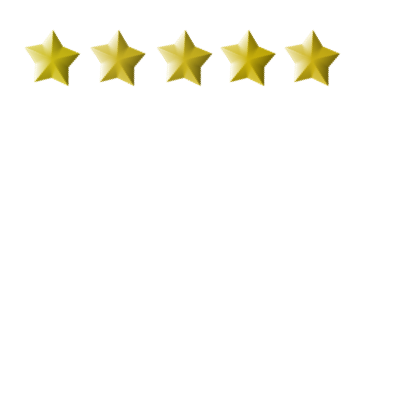 The SynthStation49 receives a 4 and a half star review from me. 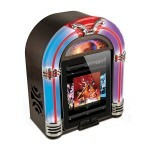 The ION Jukebox Dock is a dock that makes your iPad, iPhone or iPod into a retro jukebox. 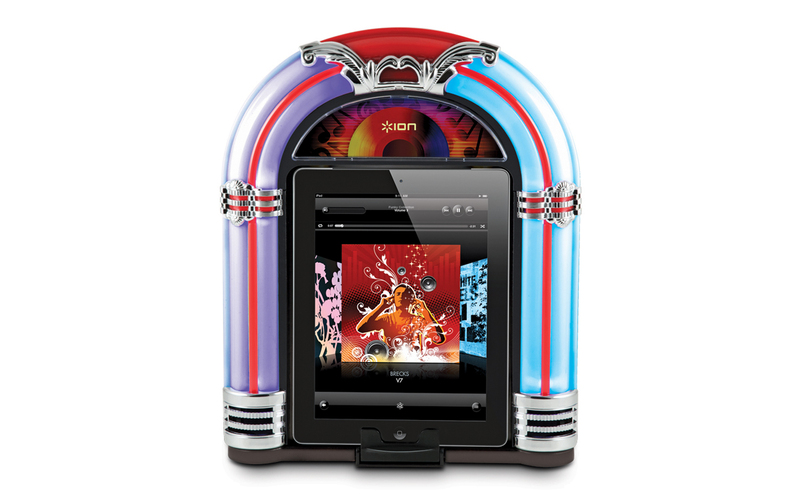 There are several apps that allow you to browse through your music library as you would on a diner jukebox giving you an authentic jukebox experience, or at least as authentic it cam get on an iPad. It is available for $99.99. Allow me to explain why it is my favorite speaker dock so far. The looks of this dock are great. Even without it being on, it looks great! The iPad looks best on it so you can take full advantage of the space available to put a device on. When it is on, it really is bright especially in a dark room. 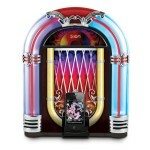 It emits lights that slowly change as it plays and a couple lights on the head of the Jukebox are going too and the dock allows you to transfer back to the 50s with music from now. It is made out of real wood on the back and sides which helps with sound quality. The back is a light brown unpolished wood while the sides are a dark brown, nicely polished wood. The front is decals that make it look like an authentic jukebox and lights that follow the curve from bottom left, up and down to bottom right, like an arch. The lights are really cool and closely resemble that of an old jukebox. 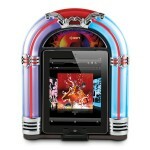 Take an old diner jukebox and add an iPad on it and that is what this is. It really is a blast from the past and a cool one at that. 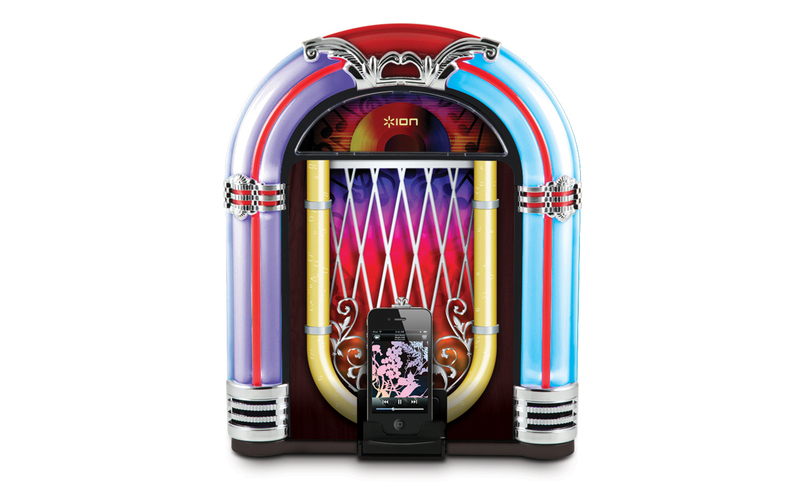 There are two things that this Jukebox is supposed to do and supposed to do well. That is A. play music at a high quality and B. charge your device efficiently. I can tell you that it does both extremely well. The music coming from the speakers sounds like the quality you would expect from speakers much more expensive than it. When I first pulled it, I thought it was just a toy and it wouldn’t have good quality. Boy was I wrong. This toyish-like dock packs a punch. It compares similarly or even favorably to some more expensive docks like some Bose and JBL docks and those not only sound really good but they are much more expensive. Another thing is that it charges the iPad at the same time of playing your tunes. It charges the iPad fast and I see an improvement over using other docks to charge it. In speaking of the iPad, there are many apps on the App Store that turn your iPad into a Jukebox control, which of course fit perfectly with the dock. A few I recommend are Diner Jukebox and StereoMatic as they make the experience very authentic, the app Diner Jukebox even has you touch the place where you put a quarter in to simulate you putting a quarter into the jukebox. This happens every time you open the app. 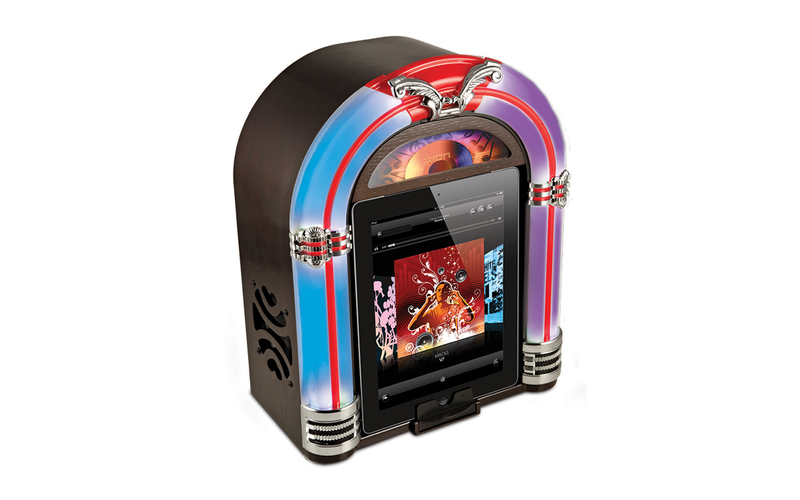 The jukebox dock and an app combined make the closest resemblance to an actual jukebox you can get without actually buying one. The function of this dock is superb. The only negative I can say about it is that the lights are so bright, you have to turn it off at night when you want to sleep (should it be stored in your room) and turning it off also turns off the charging capabilities. This is not an issue for me since I can sleep with it on but for some with sensitive eyes, that may not work for you. The only thing that should be changed is the addition of the ability to turn off the lights but not the charging ability. I think that that would be good to add. On the same token, the brightness is also a good thing for low-lit parties as it adds a lot of color to the party while providing music at the same time and even providing a conversational piece. The ION Jukebox Dock is definitely one of the stronger things I have reviewed in terms of it’s abilities and it’s subsequent rating overall and it’s power in speaker capabilities and charging capabilities coupled with it’s authentic jukebox look make it the ideal dock and easily outweigh it’s only negative. The dock easily earns five stars from me. Great job ION, you have a stellar product here. The Buffalo MiniStation ThunderBolt is a Bus-Powered Thunderbolt/USB 3.0 Portable Hard Drive available in 500 GB or in 1 TB (1000 GB) storage options. 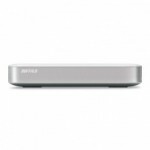 It is available for $173.99 for the 500 GB model or $196.49 from B&H. 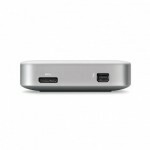 Thunderbolt is a new technology that Apple has integrated with their computers. It is Apple’s retry at FireWire (this time without the licensing fee). 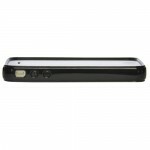 It is regarded as faster than USB or FireWire and will provide amazing speeds for backup and storage. Let’s check out Appl… I mean Buffalo’s hard drive. I made that mistake of thinking that this product was an Apple product. Yes, this drive is just that good aesthetically. The product looks like a product that Apple would make. It is clean, smooth, easy to hold, light and thin. It’s texture feels like that of a unibody laptop from Apple. On the bottom it has a light that reminds me of the light that the plastic MacBook has though this product is much more durable. I feel as though if I were to drop this product, it would not even dent. The colors on it again remind me of an Apple product. The white reminds me of the white MacBooks and the silver reminds me of the silver on a MacBook Air or Pro. If you were to remove the branding, you would think it was made by Apple, and we all know that Apple makes beautifully designed and well-made products. Therefore, in terms of aesthetics, this product is right on. 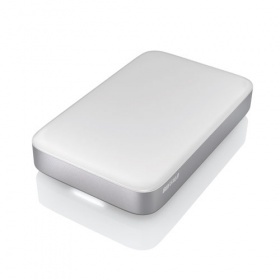 It’s the most well-designed portable hard drive I have seen and Apple should stop making the Time Capsule external hard drive and sell these instead. Truth be told, I have not actually owned a product that used the ThunderBolt connection before so therefore I did not have a Thunderbolt cable. Luckily, Buffalo had me covered there, they supplied the cable for me. Not only did they supply a cable but they supplied a short cable, which some may say is a bad thing but I view it as a good thing. Information between computer and external hard drives transfer faster when they are connected by shorter cords. Therefore, the already fast ThunderBolt was made faster by using a short cord. I have had no problems with the speed of the drive at all. The first time I backed everything up it took about 30 minutes while a USB 2.0 drive took about an hour and a half. Therefore, the claim that it is two times as fast as USB 3.0 is misleading. While ThunderBolt can be two times faster than USB 3.0, that is at the highest point. Also, the drive inside the enclosure does not handle fullest ThunderBolt speeds. However, despite this, I did see a significant speed increase over USB 3.0 and USB 3.0 was pretty fast too. The drive, with it’s small profile went right underneath the iMac and I never really see it, so it is out of the way and always connected. If you don’t have a lot of space, you can still fit it somewhere in tight corners. It contains huge amounts of space while taking a little amount of physical space. It does not have a second ThunderBolt port to be able to daisy chain so you must make it the last thing on the chain, if you already have another product that can not be daisy chained, you will have an issue. Despite that though, the drive definitely is a great machine that can store a lot of data so if your Mac is running low on space, this is the drive for you. The only way I could see to improve is to add the ability to daisy chain as I know that some people like to chain multiple drives together to create a super drive or to be able to connect multiple devices together. It would not be a bad plan as people who wanted to create a “super hard drive” out of a daisy chain of these hard drives would buy multiple hard drives from them, the company would make 10 sales from one consumer rather than one or none. To conclude, this could be an Apple product. It’s sleek design and fast transfer of data make it an ideal drive, that is if you can mind the price and the lack of daisy chain ability. It is recommended most to those who have USB 2.0 and ThunderBolt since with this drive you will see a significant speed increase. This external drive earns a 4 and a half stars from me. Great job Buffalo! 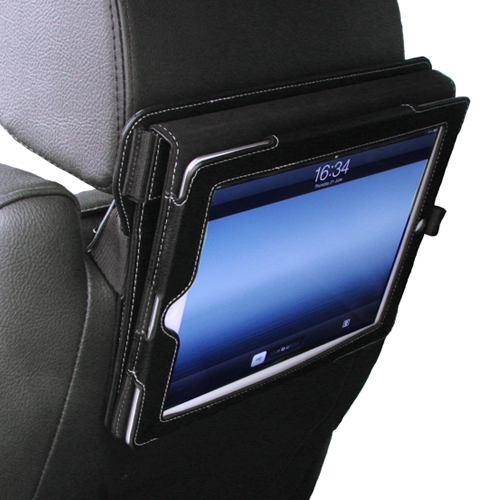 The Snugg iPad Car Headrest Mount is exactly as the name implies. It is a mount that attaches to the back of the seat of your car that you can attach your iPad to. 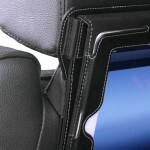 The Snugg iPad Headrest Mount is available from Snugg for $25.99. Let’s see if it is for you. The form on this product won’t be nearly as important as the function but I thought I would highlight a few things. This is not the most well-constructed product out there from Snugg. When using the product, I had a feeling that it wasn’t made as well as other Snugg cases in the past. Of course, it is not a case but it should at least be sturdy. The strap that wraps around the headrest is not very long and I could not fit it on one of my cars and it barely fit on the other. The material it is made out of is like that of a Snugg case and that’s a good thing. The little brackets the hold the iPad in place are held in pretty good; they won’t fall off. There are a few things on the mount that are positive aesthetically but overall, I felt it was made cheaper than the other Snugg products. Snugg has some things to work out in terms of the functionality of the product. First off, when I first received the product I took the case off of my iPad to put the iPad on the mount but it turned out that I needed the case. The case, very awkwardly, attaches to the mount. Therefore, if you are someone who doesn’t have a Snugg case already, prepare to be disappointed as you will need to spend another $30-$40 for a Snugg case if you want to use the mount. As I mentioned, it is very awkward actually putting it on the mount as the flap on the iPad case goes inside a slot and the flap bends while you are trying to put it in and it just gets frustrating. It shouldn’t be frustrating. In addition, the mount does not fit on all vehicles and putting it on the car rest, if you can fit it on your car rest, is a hassle. I tried two cars with this product with limited success. The mount would not fit on Car #1’s headrest at all and it barely fit, with some struggle, on Car #2. That is an issue. If it doesn’t fit, it’s useless. I wonder how many other cars it doesn’t fit on? Why take the chance? The ways I think Snugg can improve this mount unfortunately are numerous. First, make a mount that can fit all iPads. Second, make a mount that can fit all cars, are at least make an attempt to. 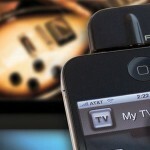 Third, allow for easier installation and deinstallation of the iPad into and out of the mount. Fourth, put some backbone into the mount, it feels as though it will buckle from the weight of the iPad. Snugg has disappointed me this time. 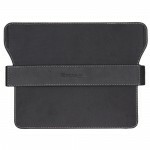 They make some wonderful cases for the iPad, cases that are worth a lot more than they are asking. However, I just feel let down with the mount. It underperforms, doesn’t fit my car or barely fits my other car, and it just doesn’t seem built like my Snugg iPad cases. 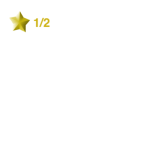 Unfortunately, I do have to give Snugg a 1 and a half star on this mount. 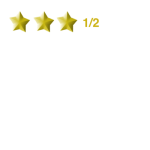 This review is the only time that I had to pause and think about the positives. Snugg, stay in the iPad case business, it’s your best business. Readers, despite this product being lackluster, I do ask you check out their iPad cases, they are some of the best I have ever reviewed. 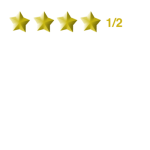 Below are the URLs to the reviews of their cases. If you end up buying one, make sure not to add the Mount to the cart as well. The The Snugg iPhone 4/4S Anti-Radiation Case is exactly as the name implies. It is a case for your iPhone that blocks the radiation from going to your head. There is science to prove that radiation does indeed enter your head after prolonged use of the cell phone due to the rays of cellular radiation being right next to your head for a long period of time. Prolonged use of cell phones and the radiation it brings may be harmful to our head. The FDA says it doesn’t bring health affects that it knows of but the risk when using a cell phone does increase. The anti-radiation part comes at a premium on this case. The case is $49.99 from Snugg. Let’s see if it is for you. I have to admit, when it comes to the form of the case, I was surprised in a good way. The case did seem like it was fairly durable, not sure if it is durable enough to handle a big fall. The material it was made out of was firm to hand, as it should be. The case is only in black but it does look pretty sleek. It didn’t add much weight or width to the phone and it fit comfortably. The case does not stick to your pocket when it is inside the pocket which is a good thing. I have used cases in the past where my whole pocket came out along with my phone, chasing bits of paper that I had stored in my pocket was never fun. The case looks as though it would be cheap and that it would bend but when I tried bending it, it held up pretty well. However, I am not sure if the case would hold up in a fall. The case has all the appropriate cut outs and it doesn’t have the annoying port protectors, which since I found out that some cases ship with those pesky things, I have been on the look out for ever since. They are almost always a negative. Overall, the case does have good build in terms of material and what it should be like aesthetically. This is where things get a little tricky. The case is supposed to protect the iPhone in case it falls so it will prevent the phone from breaking. However, despite the fair build quality, it doesn’t seem as though it would hold up in a big fall. Albeit big falls don’t happen everyday but I would not feel comfortable with my phone in this case if I kept it a high counter over hard floor. It may break. With other case, I wouldn’t do that. However, despite this, it is the first case I have seen that involved a bit of science. The case, according to Snugg, reduces Cell Phone Radiation or SAR by 92% and Hot Spot Radiation or EFI by 90% so it does do well in protecting our heads (testing performed in private labs, chance of false claims). Long term use may reduce the risk for cancer, brain tumors, Alzheimers, Parkinson’s, Fatigue and headaches. Therefore, this case may not be the best in protecting the phone but it does protect your health and that is what is really important. Snugg has always amazed me with their cases and this case definitely was an interesting one. If I were Snugg, I would look into putting more protecting material into the case to protect the phone better. It may sacrifice it’s low width but I think it is a good trade off, the main purpose of a case usually is to protect, right? Also, unless the material they use to make the case is expensive, they need to lay off the price. No iPad case on their site is priced that much. The case may not be the best in terms of protecting your phone but it does the job. It does a better job of protecting you than the phone. If it can protect me from the radiation like it says it can and if San Onofre decides to burst, I’ll be sure to use this case. I give the case 3.5 stars for it’s protection of the user but not so much protection for the device. *The claims that Snugg have made may or not be true. As I am not a radiologist or a scientist, I can not test to see if it actually does protect you from harmful radiation as it advertises. Many companies have made false claims before and I can not guarantee that Snugg is not one of these companies. I have based this review on Snugg being honest and the tests correct. If evidence proves that they have lied, this review will automatically be reduced to zero stars. If you have any information about the validity of their claims, please contact the Editor-in-Chief or leave a comment.